The Berkeley Center for New Media has organized a second year of the History and Theory of New Media lecture series, the first of which takes place this Thursday. It’s an excellent line-up, and though I technically have to be at every talk as one of the event organizers, I would no doubt have been drawn by the tantalizing topics (particularly the focus on materiality). 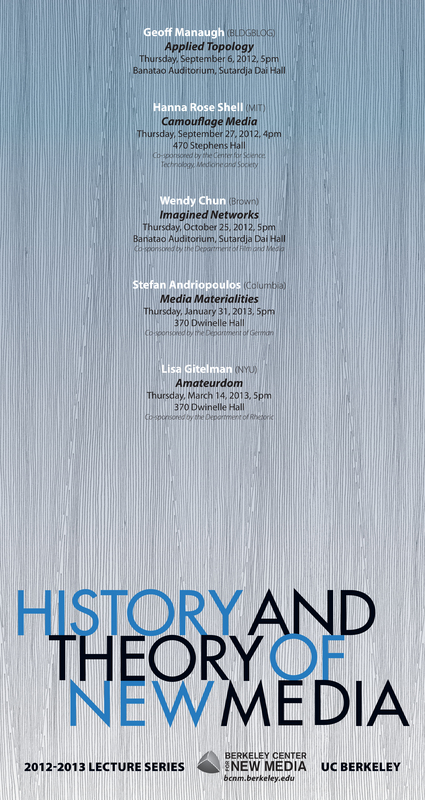 Here’s the full line-up, with additional information for the kick-off lecture this week. Geoff Manaugh (BLDGBLOG) kicks off the 2012-13 History and Theory of New Media lecture series with his talk “Applied Topology,” on burglary, tunneling, and urban perforation. Manaugh will discuss the city as seen—and, more importantly, used and misused—by people other than architects and urban planners. Ultimately asking if spatial crimes such as breaking & entering and burglary have anything to offer urban theory, “Applied Topology” explores an alternative, even ilicit, understanding of how the city can be used and operated. From Gordon Matta-Clark to the tunneling crew of The Bank Job, how does applied topology – the forced introduction of unplanned connections, performations, holes, tunnels, and cuts – transform our relationship with architectural space? Geoff Manaugh is the author of BLDGBLOG, former senior editor of Dwell magazine, and a contributing editor at Wired UK. With Nicola Twilley, he is currently co-director of Studio-X NYC, an off-campus event space and urban futures think tank run by the architecture department at Columbia University. The History and Theory of New Media series is produced by the Berkeley Center for New Media with support from the Center for Information Technology Research in the Interest of Society (CITRIS). « The Art of Video Games?